YiWu was ranked 47th in comprehensive economic strength of China’s city-counties nationwide in 1995, and became Zhejiang’s first city to undergo experimental comprehensive economic reform. It has jurisdiction over 15 towns and 8 villages, covering 1100 square kilometers, 15 of which are urban area. The Small Commodities Market in Yiwu is famous throughout China. 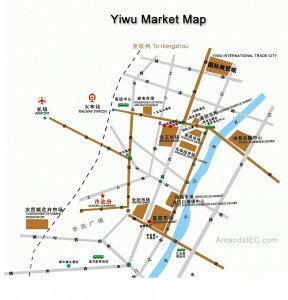 Yiwu Market Map: China Yiwu International Trade City, Yiwu Futian Market, Yiwu Household Electrical Apppliance Market, Yiwu Correspondence Market, Yiwu Cosmetics Articles Market, Yiwu Furniture Market,Yiwu Binwang Market, Yiwu Sport & Exhibition Center, Yiwu Spectacles Market, Yiwu Import & Export Exhibition and Trade center, Yiwu Huangyuan Market, Yiwu Knitting Market, Yiwu Flower Market of Farming Products City.